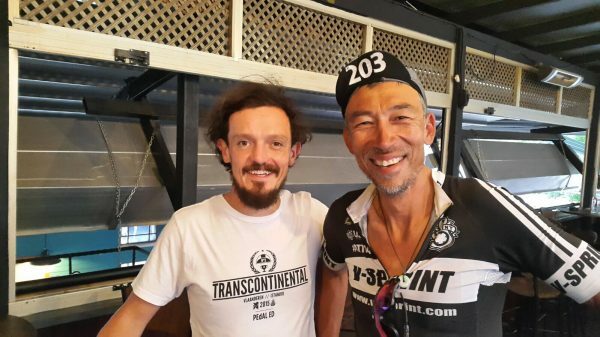 Last year V-Sprint member Olly Kan, entered and completed the Transcontinental Race Across Europe. One of the worlds toughest unsupported ultra-endurance races. Our club motto is #OTTNA (only the tough need apply) we have it written on our kit, Olly single handedly had raised our club bar. It was an introduction to many in our club to the world of ultra-endurance cycling and many of us became fans or ‘dot watchers’ – logging in to the website throughout, following him through the race and excitingly tracing and discussing his progress. The principal organiser of the TCR, Mike Hall, was tragically killed on the 31st March near Canberra on the last stretch of the Indian Pacific Race, just a couple of hundred miles from the finish in Sydney. Olly had met Mike a few times during his race and echoed many of the tributes paid – Mike was humble, modest, safety conscious and forthcoming with good advice and tips in a personal way Mike inspired thousands of people around the world to simply ride their bikes. In Mike’s honour V-Sprint have planned a tribute ride, the aim is to complete the 200 miles that Mike had left of his last race. There will be two rides on Sunday 30th April both leaving Finstall Village Hall and meeting in Tewkesbury for lunch. All riders are welcome to join us and would ask a small donation either on the day or direct to Mike’s justgiving page.